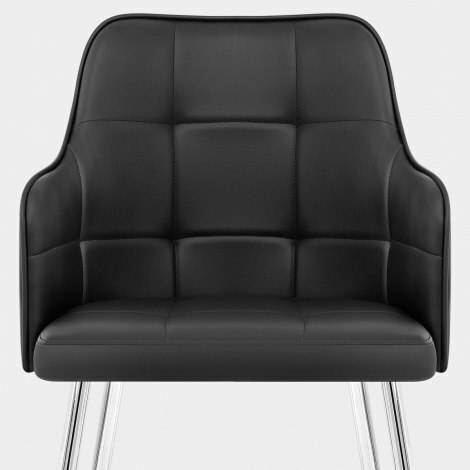 Delight in the Dawn Dining Chair Black, a fashionable design with first-class comfort. An ergonomic piece of furniture that is brilliantly stylish too, the Dawn Dining Chair is sure to flourish in your kitchen, dining room, or even in the bedroom. 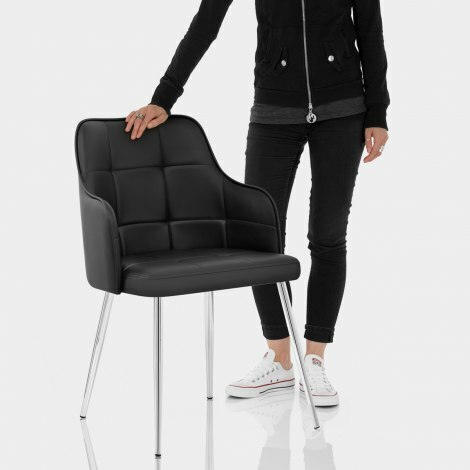 The item's armchair-like design fuses bountifully padded faux leather with supportive styling. The handsome, panelled backrest curves around, generating a stylish perch for the elbows and giving the Dawn the capacity to help you achieve nirvana. Four voguish chrome legs, with protective plugs support the seat and are in turn supplemented by protective plugs on each foot, coming together to produce a dining chair with a difference. "Very good chairs and very good service all round"
Nice solid chair easy construction and looks nice and modern. Really pleased. Chair is excellent quality. Was packaged well and speedy delivery service. Very good chairs and very good service all round thank you. Required for a consultation area. Fits the bill perfectly. Dealt with this Company before would recommend.